At the same time, the Platinum 3776 Century Sai had entered my pen collection without much fanfare. It has, in fact, quickly become one of my favorites in the past couple months. So, I thought I could do a double pen review with a Platinum pens head to head comparison. In general terms, both the Platinum Cool Crystal Rose and Platinum 3776 Century Sai are acrylic demonstrators. The Crystal Rose, as its' name suggests, is made of a clear pink acrylic while the Sai is completely clear with minimal embellishments. 'Sai' refers to the Sai (West) Lake in Japan. It is one of the five lakes that surrounds Mt. Fuji. Sai Lake is famed for its crystal clear waters, hence the name and design choices used in the Sai. The Cool is also available in a blue crystal. A non-demonstrator version of the pen is available as the Platinum Balance. In comparing the Cool to the 3776 Century Sai, the capped Cool is a slightly shorter, narrower and lighter version of the Sai's torpedo cigar shape. Uncapped, the cap of the Cool is slightly longer than that of the Sai. Whereas, the pen body of the Sai unposted is shorter than the Cool. Posted, both pens are about the same length. From the tip of the nib to where the section meets the pen body is about the same length on both pens. However the Sai has a much larger and longer nib than the Cool. Thus, the grip section itself is shorter. I have to grip on threads as well. Threads are not sharp or uncomfortable to hold. The grip section of the Sai is slightly wider in diameter which I find more comfortable to grip, requiring less finger pressure. The grip section of the Cool tapers to a metal ring that then flares out slightly to help prevent slipping. I find it helpful since the section is long and narrow compared to that of the Sai. Since the Cool is a snap cap, there are no threads on the body of the pen. 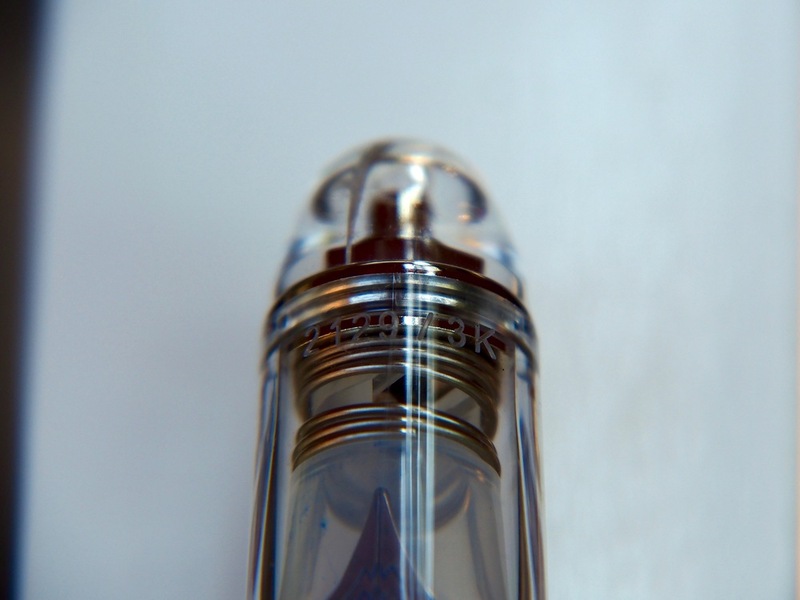 The cap of the Sai is made of the same crystal clear acrylic. It is a twist cap that require 1-3/4 turns to remove. Inside the cap is a milky translucent insert that is key to Platinum's 'Slip and Seal' mechanism. The company claims that it can keep the ink from drying out in the pen for month, up to a year even. I've not tried this with my pens. I can certainly go days or weeks without using the pen then pick it to write without missing a beat. There is never a hard start. The inner cap is held in place by a silver spring, screw and washers. All if it looks well machined and precisely put together. It's fun to see how the inside of the cap is constructed. Usually we don't give much thought about things like the innards of caps. Now, a fair warning to OCD pen addicts out there. Since the entire cap is see-thorugh, one can easily see drops of ink trapped inside the cap. A quick rinse solves this problem as can a swirl with a twisted piece of damp paper towel. Finally, the Sai sports a stiff silver clip. The opposite side of the cap has an engraving 2129/3K which notes the number of my pen from the 3000 pen limited edition run. For the Cool, the cap is also made of the same pink transparent acrylic as the body. It sports a silver clip and a silver band at the base of the cap. Inside the cap is the solid white inner cap of the slip and seal system. The inner cap is merely friction fit. I often find ink trapped between the outer and inner caps which requires some effort to remove the inner cap for proper cleaning. The Sai comes with a Platinum converter that has silver hardware which matches the rhodium plated furniture in the pen itself. Curiously, the Cool came with the same converter but with gold coloured hardware which clearly don't match the silver furniture of the pen. Thankfully the pink body makes this mismatch less obvious. Silver converters are available separately now. I would get a silver converter when it's time to replace the current one. Unposted, the Sai is short than the Cool but it is not a mini pen by any means. I can write with it unposted but someone with larger hands may find it too short. Posted, the balance shifts slightly more to the back but the balance is point still lies within the crook of my thumb. Thus, it's comfortable for me posted as well. I post this pen maybe 50% of the time. I think I'm just more of a "don't post" kinda gal. The Cool is longer than the Sai and can be used unposted. The cap posts deep so that it ends up being the same length as the Sai posted. This pen is also well balanced posted or not. The rhodium plated nib of the Sai is quite large. It has a pair of parallel line engravings that matches the profile of the tip. The design is simple and minimalistic. The nib has a cute heart-shaped breather hole. Under the nib is the black plastic slotted feed. The 14K medium nib has been a pleasure to write with and leaves a finer than medium line. The nib is extremely smooth on many papers. Although made of gold, the nib is tuned fairly stiff but it is still buttery smooth. There is little line variation. I fell in love with it from the moment I wrote with this nib. This pen is very reliable. I've never had any issues with hard starts or skips. It writes with just the right amount of wetness that makes it suitable on many papers. The nib of the Cool is made of steel. It is small and narrow compared to that of the Sai. There are no embellishments except for a simple "P" for Platinum. the breather hole is a simple circle. The feed of the Cool is quite...cool. It is made of a wedge of translucent plastic. There are no slots. It picks up the colour of whatever ink is in the pen. It's fun to see the ink in the feed. The Cool is famously known for its semi-flex nib. The company does not market it as such but many fountain pen users like to write flex with it. The fine nib writes more like an extra fine and gives quite a bit of spicy line variation without having to change to a flex pen for a little flourish. Having said that, I can't write flex with this pen for too long as my hands tire easily from the pressure. The Cool's nib is smooth but toothy. On Tomoe River paper it glides, but on other papers, the toothiness is quite apparent. It's not unusual to catch paper fibres on the nib, even from Rhodia paper. The Sai is regularly priced at over $200. I got mine on sale from Pen Chalet with a Pen Addict promo code. The Sai EF is sold out but Pen Chalet has the still has the Platinum 3776 Century Sai with Bold nib as well as Nice available. I got mine for well under $200 which I think is a fantastic deal. Even at regular price, the wonderful gold nib, quality materials and precise construction makes it a good value compared to similar sized demonstrators from other pen manufacturers. I love my Sai so much that I started to hunt down the other limited editions in the series: namely the Yamanaka and the soon to be released Kawaguchi. The Cool is 1/4 to 1/3 the price of the Sai. Visually, one can see that one is more expensive than the other. The gold nib makes up at least $100 of the difference. Whether the rest of the price difference is worthwhile for the Sai is personal question. The Cool is great value for sure. It writes well and it's a pen I don't mind taking everywhere. I would feel sad if it got damaged or lost but I wouldn't cry over it. The semi-flex nib in quite unique on the cool so definitely worth a try for this alone. I've enjoyed using the Cool for creative expression but the Sai's surreal writing experience is something that cannot be over emphasized. I love, love, love this pen. Although the Sai is pricier, I'd be more inclined to get another Platinum 3776 Century than the Platinum Cool. The acrylic body of the Sai is crystal clear and beautiful to look at. The pen feels weighty for plastic but very comfortable for long writing sessions. It is a no-fail workhorse pen. 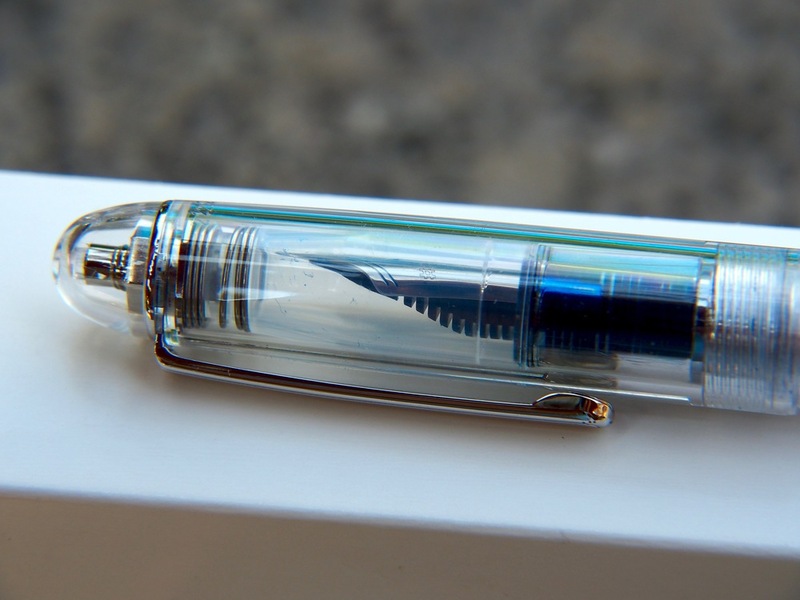 The Cool has it's own unique and fun features such as the semi-flex nib and the clear feed. The EF nib can feel a bit scratchy on scratchy on some papers. So, all in all, each pen has a rightful place in my pen rotation. Note: I have included links above for reference purpose only. None of these are affiliate links and I am not compensated in any way for providing links.